Your monthly dose of funny on the Kapiti Coast. 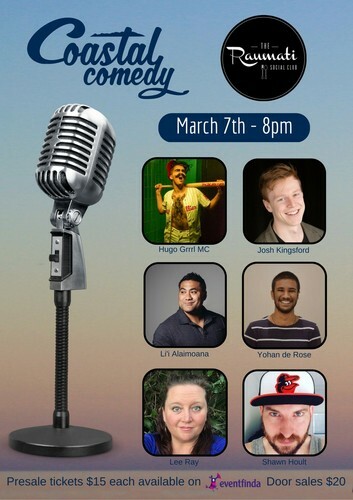 Come and join us down at The Raumati Social Club for a fun night of laughs and some surprises, you never know what will happen. This month we have the talented and hilarious Hugo Grrrl as our MC. As usual, we have 5 other comedians on stage to make you laugh, and make you laugh they will! With a range of comedy styles and material, there is sure to be something to meet every sense of humour. Come and join the fun, it is a great way to spend a Tuesday night on the gorgeous Kapiti Coast. It is a small but perfectly formed venue so it's best to get your tickets in advance to avoid disappointment. The Raumati Social Club is famous for its excellent service and delicious food. Full dinner service available so come and make a night of it.